In the Tag Synonyms page, if I clicked on any of the tag under the Synonym section, it throws the following error page. For example: duplicates. 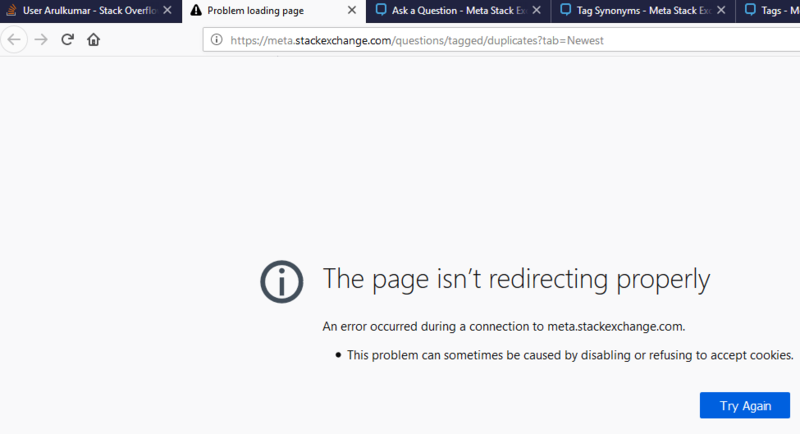 An error occurred during a connection to meta.stackexchange.com. Is this a known issue or a error? This embarrassing bug will be fixed in the next build. Not the answer you're looking for? Browse other questions tagged bug status-completed tag-synonyms cookies custom-question-lists . Blog search by tag will never complete?